“I wasn’t allowed to say it was Doctor Who at any point – not talking to my agent, not when I arrived at the audition, and I certainly couldn’t tell anyone at all what I was up to next,” the 25-year-old actress says, admitting that she was surprised at how good a fibber she became. Jenna also told RadioTimes that she was named after Jenna Wade from Dallas. 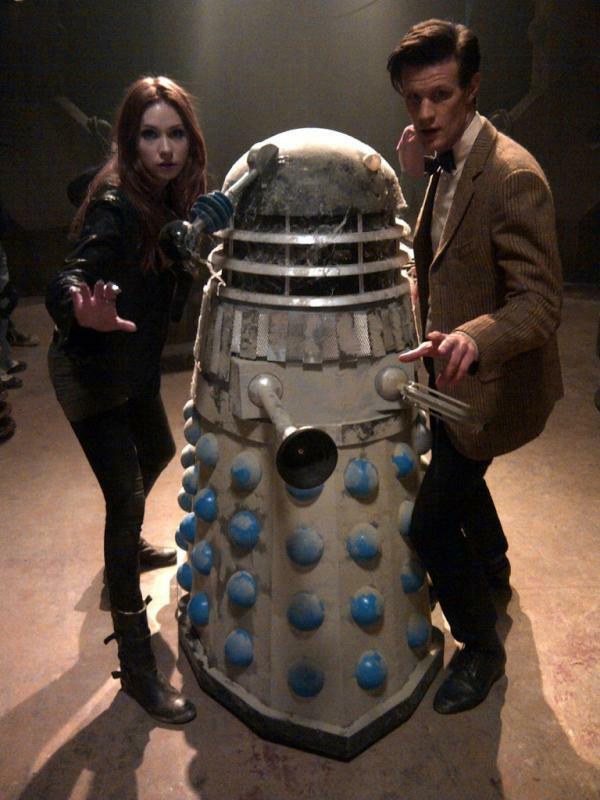 When the Daleks appear next season, it appears there will be models going all the way back to the 1960’s versions. Steven Moffat tweeted the picture above. Steven Moffat says another Doctor Who spin-off is unlikely at present. That isn’t very surprising as there aren’t any current situations which would make good spin-offs, and Moffat is already busy with two shows. Perhaps if both Amy and Rory survive their final encounter with the Weeping Angels, which doesn’t sound likely, he could write a sit-com similar to Coupling about them. No, not very likely to happen. CA: You know, Russell [Davies] is so busy. Obviously, we’re in touch with the BBC all the time. They are our partners on DaVinci’s Demons and the Harem project that you just mentioned. We told them, we stand by ready for any news, but I think it would be a while before Russell came back to Torchwood. Nothing As It Seems returned to an old episode of Fringe in which things play out differently. Olivia is strangely unconcerned about losing her memories of the timeline she is actually living in, but the FBI wasn’t as complacent. In the end, they realized that an Olivia without much of her memory is still a more useful agent than most. Of course her memories of the other timeline could also provide valuable information if they continue to face the same menaces. I have been disappointed in the current season because it seems to be ignoring the way in which the previous season played out, with the existence of both universes in jeopardy. The season concluded with Peter bringing the two universes together, presumably to work together, but this idea, along with Peter’s existence, was quickly forgotten. Next week returns to the alternative universe to investigate the shape shifters and show more of the hotter Altlivia. Perhaps at some point they will remember the major problem (or did changing the time lines make this less urgent?). More importantly, Fringe‘s ratings rebounded on Friday. Most likely ratings were down the previous week due to a combination of having been on hiatus and coming back against the NCAA Tournament. Fox is also joining the twitter campaign to keep Fringe alive. Netflix has decided against saving Terra Nova and the future of Fox’s other genre shows remains in doubt. Alcatraz completed its first, and possibly only, season. We learned some things such as that the Warden appears to be behind things (no surprise) and that the lead infusions are to track the prisoners who came from 1963. Rebecca appeared to die, but there is little doubt that she will come back to life should the series return. If the series does not return, I bet fans will be far more frustrated by the lack of more information about what is going on. Disney often decorates their monorails for big events, and currently the monorail promotes the upcoming Avengers movie (video above). This is only being done on the Magic Kingdom monorails and not the monorail to Epcot. This might be because the Epcot Monorail takes a loop through the park. While Disney has purchased Marvel, currently Universal has the license to use Marvel characters within their theme parks. A Star Trek script written by Norman Spinrad was found last fall. CBS, which owns the script, isn’t allowing a planned fan-produced version of the script to be filmed. Game of Thrones returns tonight. Here’s a review should you need one. April Fool’s Day has led to posts claiming Doctor Who is being cancelled, that Jenna Louise Coleman is actually taking over as the first female Doctor, and an offer to adopt a Direwolf cub. The cost is only $2499.99. Posted in Humor and Satire, Science Fiction, Television. Tags: Alcatraz, Coupling, Daleks, Doctor Who, Fringe, Game of Thrones, Jenna Coleman, Science Fiction, Star Trek, Steven Moffat, Terra Nova, Torchwood. RSS feed for comments on this post.. TrackBack URL.